Kirk Hanser has performed for hundreds of weddings and other special events over the past 30 years. He has performed throughout the U.S., Europe and Japan since the mid 80 as a soloist and ensemble member. 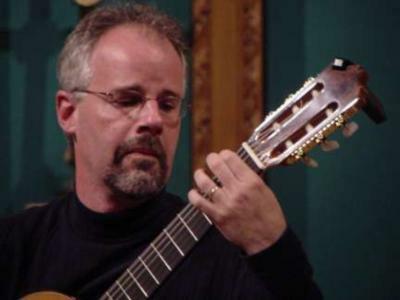 Locally, he is one of the on-call guitarists for the SLSO, the Muny and Opera Theater. Kirk is happy to provide music for your upcoming special event! He has music from the past 500 years ready to go, which can be used for anything from calming background music to exciting foreground entertainment for the evening. We had a small cocktail party where Kirk provided background music, it was lovely and perfect. Every single guest commented on how pleasant it was. Kirk arrived early, setup quickly, and played beautifully. We thank him very much! Thanks so much, Pat - playing for you and your guests was my pleasure! Kirk did a great job for our event. He was on time, looked the part, brought all his equipment suited for the gig and played great music. The selection and sound was perfect for our needs. I would definitely recommend and hire Kirk for future gigs. Kirk is a very talented guitarist! One of my guests who was really into music complimented his performance and several others did as well. He was easy to work with in choosing the music. He also was not pressing to be in the limelight or a prima donna. He was late in arriving was the only negative...be sure and give him good directions. He is sometimes delayed in getting back to you as he does work out of town and is not always connected to the internet. I would definately use him again. Thanks for the wonderful review! Wow, being late was like a bad dream... I received the wrong address through Gig Salad, thanks to (what I have to assume) was an auto-correction during the initial booking request that changed "Lane" to "Road". **Clients and performers alike - beware of auto-correct, and always ask the client to double-check the address! ** Thanks again, and best of luck! Kirk did a beautiful job and we were very pleased with his performance. Would hire him again. Kirk had an emergency and was not able to attend but made sure we had an excellent musician for our party. All was wonderful. Kirk played for our wedding ceremony and cocktail hour. He was great to work with! Kirk Hanser was prompt, professional, and provided extraordinary music for our wedding day. We couldn't be happier about the level of specialness he brought to our ceremony! Thank you, Kirk! Kirk played beautifully for my guests and created a peaceful yet festive atmosphere for a holiday cocktail party. This was exactly what I envisioned for my intimate ceremony. It was perfect. Kurt created a peaceful, festive environment for a holiday cocktail party. Everyone enjoyed his performance. Kirk is a wonderful musician. The music he played in the background, combination of Spanish, flamenco, jazz was beautiful. My guests clapped several times. My 18 year old son loved it as well. Thanks Kirk, making a special evening even more special. Kirk was accommodating, patient, and calming. The music portfolio that he selected and played was wonderful. He will be my first selection on any future events. The music selection for wedding receptions and other "casual" events is beautiful - through not distracting - background music so that your guests can still visit with each other and enjoy the real star of your event, whatever or whoever this may be! House concerts/corporate shows feature basically the same entertainment level and repertoire which you would expect if seeing Kirk perform at any big-name concert venue. Regardless of your needs, Kirk will be on time, professional, courteous to your guests and ready to go! Kirk has performed throughout the U.S., Europe and Japan since the mid 80's as a soloist and ensemble member. 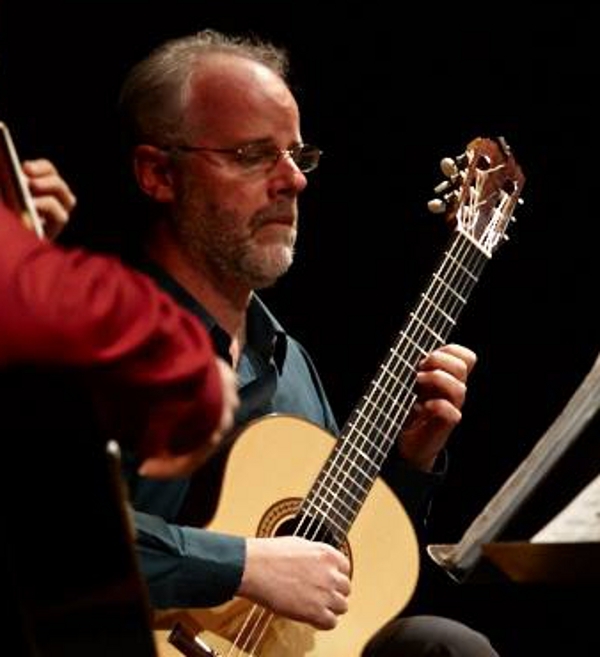 In concert and on recordings these days, he is mainly heard along with John McClellan as the internationally acclaimed Hanser-McClellan Guitar Duo. Kirk can be heard on many recordings alongside McClellan, as well as with Tommy Emmanuel, Vince Gill, Mark Knopfler and many others. 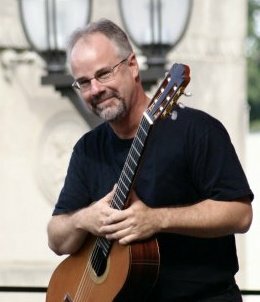 Kirk currently lectures and teaches for several colleges and universities, arranges music for events and publications, and acts as director for both the Childbloom Guitar Program and the St. Louis Academy for Guitar. 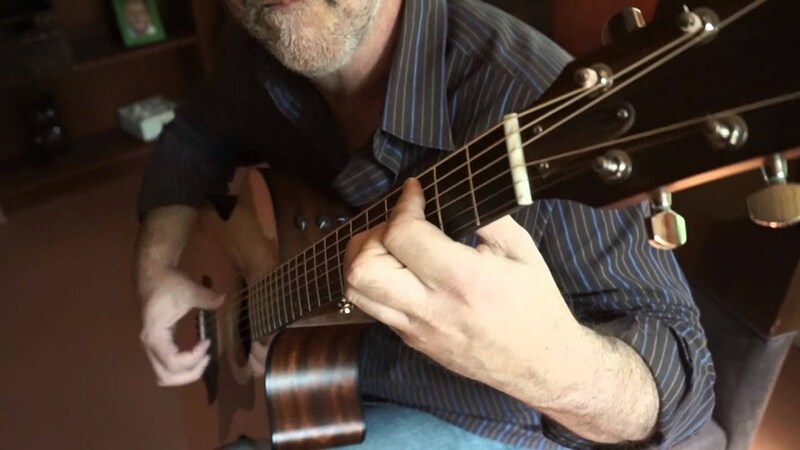 Locally, Kirk performs regularly as an on-call guitarist with the St. Louis Symphony Orchestra, St. Louis Opera Theatre, the Muny, as well as weddings and corporate events. - If outdoors, must be reasonable climate (no rain, temperate, etc.). Inquire.